Therese Martin was born 140 years ago today in France. She was the youngest of five girls and she had several siblings who had died in infancy. Her mother, Zelie Martin, died of breast cancer only 4 years later and it is likely that her disease was in the early stages when her last baby was born. For several reasons, Zelie decided to place her newborn with a wet nurse who lived a short distance outside of town. Due to the winter weather and other intervening factors, Therese was almost a year old before she was weaned and moved permanently home with her family. Zelie’s letters to her friends and family during the few years before her disease overcame her, reveal her joy and frustrations in caring for her youngest daughter who, in today’s terms, might have been called “strong willed.” Her mother describes Therese’s outbursts of joy that were quickly followed by temper tantrums. As the youngest in a house of women and servants, little Therese admits that she was doted upon. When the topic of following St. Therese’s “Little Way” of spiritual childhood comes up, I’ve often heard otherwise educated adults say that Therese was “too saccharine” or the way she proposes is “just for women” or that her autobiography, Story of a Soul, is just “boring.” These comments always make me laugh. I can’t help it. Therese ended up fighting a battle over her self-will and pride and fears that makes me cringe a whole lot faster than thinking of being tied to a stake and burned to death like the saint Therese most admired, Joan of Arc. Any strong willed person (I’m raising my hand) can easily affirm that death-to-self is not for the faint of heart and it is certainly never boring. That’s why we’re going to spend some time delving into Therese’s advice and example during the rest of this Year of Faith. She was fond of telling her novices in the Carmel that, “A person can’t be half a saint. You have to be a whole saint or no saint at all.” If we’re going to evangelize anyone in this world, we need to start with ourselves, as Benedict XVI tells us. The Little Flower, who is a Doctor of the Church, recommends the Way of Spiritual Childhood for our conversion. If it was good enough for her, it’s good enough for me. 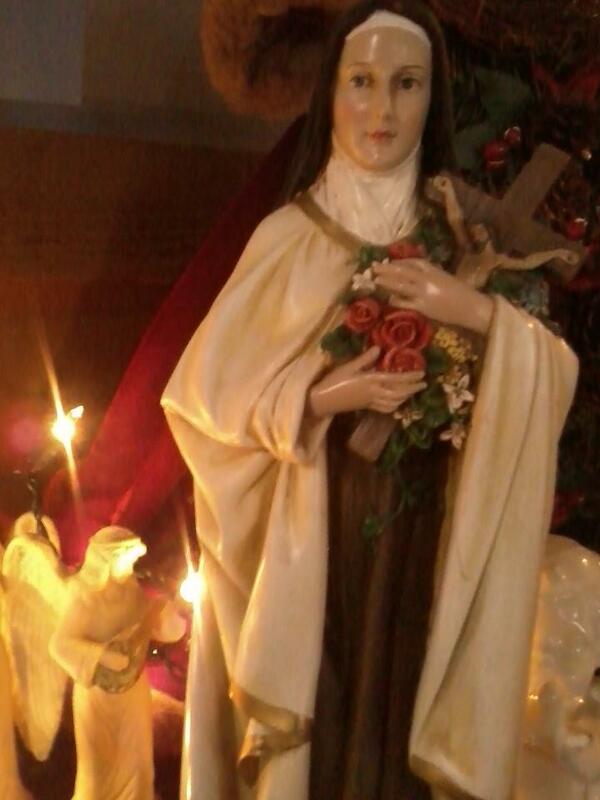 I love St. Therese and I agree, she was anything but saccharine! Love the bishop’s quote. I look forward to more about Therese! God bless!